“We are bringing in packages from all over the United States,” said Kerry Person, vice president of Amazon Logistics during a tour Nov. 9 of the facility, which spans 80,000 square feet and has more than 300 employees, not counting drivers. Amazon set up a sorting center in Aurora in 2016 to speed delivery times, followed by a large-item fulfillment center, also in Aurora, in 2017. This summer, Amazon opened a robotics fulfillment center in Thornton with 1,500 workers. After orders are filled at a fulfillment center, many still go to carriers such as the U.S. Postal Service, UPS Inc. and FedEx Corp. But Amazon has built more than 75 delivery centers in North America and an increasing number of packages are headed there. Centennial now has a delivery center, as does Colorado Springs, and more could be landing in the metro area, Person hinted. The cavernous warehouse with 30-foot-high ceilings wasn’t bustling during a media tour Nov. 9 just before noon. That’s because the bulk of packages come in during the night and were sorted in the wee hours. Delivery vans were loaded and went out in the early morning hours. Semi-trucks from the two metro fulfillment centers, as well as from others across the country, come in at night and unload. Workers scan packages and software groups them so they can be delivered in the most efficient way. Workers place the packages in bins on racks that are then rolled onto delivery vans. Ever see a brightly-colored little sticker on a box? That is a sign it has gone through an Amazon delivery center. Amazon gains some things through its centers that it can’t get with third-party carriers, such as photos sent to prove a package was left on the porch, the ability to leave packages inside a house or car trunk for customers who sign up for that and Sunday delivery. 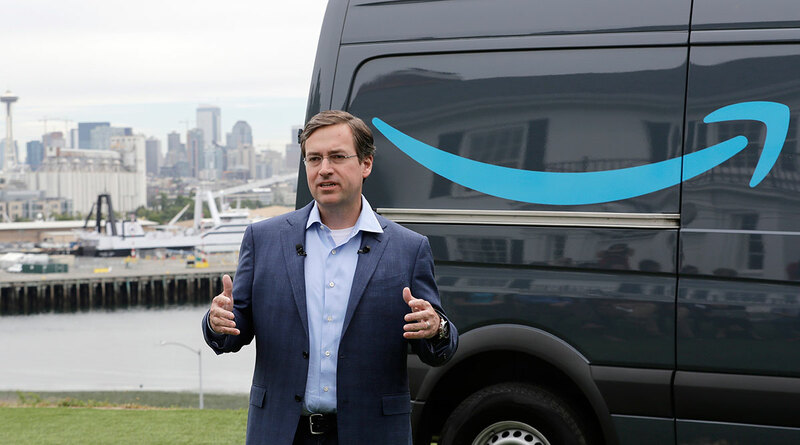 Amazon has contracted with small businesses, delivery partners, who hire drivers and lease Mercedes-Benz Sprinter vans to make the deliveries. Amazon recently put in an order for 20,000 of the vans, which are produced in South Carolina. Todd Creger, owner of Mile High Prime Delivery, and Richard Leddon, owner of Rhino Logistics, are two delivery partners Amazon has recruited locally. “It’s an exciting time,” said Creger, a military veteran who started last month with a half dozen employees and now has up to 30. Rhino has 20 employees and already has 10 vans just a month after starting the business, Leddon said. Given the growth expected at the delivery center, drivers are the bottleneck. “We are looking to hire drivers,” he said. Amazon also has its Amazon Flex program that hires independent contractors with their own vehicles to make deliveries. Those drivers can make $18 to $25 an hour, said Tanner Morley, manager of the South Denver Delivery Station. None of the vans is self-driving, Person said. And drones — they weren’t anywhere to be seen, not even a drone landing pad. But that doesn’t mean they aren’t part of Amazon’s future.